As of 8/8/2018 trout has had very good action reported all over the reservoir. There have been high counts of fish under 16 inches with several larger than 20 inches reported being caught. Trolling still seems to be the best approach for catching fish. Reports of salmon actions have been slow. Try the main channel 30'-35' near Deer and Duck Island. Trolling with Cowbells, Needle Fish or Dodger Squid. Fishing for Northern Pike is fair underwater vegetation along south shore. Switch up your colors often to get the most action. Aquatic Nuisance Species Inspection hours for the month of May are 6:00 am-10:00 pm daily. As of 7/30/2018 water temperatures are in the mid 70's fishing has been slow for trout. The crappie and white bass seem to have transitioned a bit deeper and are being caught in the main lake. Walleye fishing has been good using jigs or trolling the deeper sections of the lake. Reminder -No fishing from marina slips or docks (next to is okay but can't use them in any way. As of 8/2/2018, fishing for trout is very good. Flies are doing very well this week with several 23 to 25 inch fish reported. Chronomid flies, green and brown being favored colors, tube jigs, Tasmanian Devils are working well. Fishing for Northern Pike is good at the North end along sandbar. A few fish over 45 inches were reported. Rapalas & Crocodiles, Pink/silver spoons are working. As of 7/29/2018 activity has picked up the past couple weeks. Walleye are regularly being caught throughout the lake and from shore. Reports of smaller fish being caught have increased, so have a tape measure ready to make sure it's legal! Wiper are feeding on the shad in the reservoir. Carp fishing has been consistent for the people targeting them. As of 7/31/2018 Lake level is dropping every day approximately an inch a day. Surface water temperature is approximately 79 degrees. We are open to boating. Fishing has been fair to good for crappie, wiper and walleye. As of 8/10/2018 the fishing has been slow to decent depending what you're after. The water level is about 72% so around 25 below the "full" mark. The smallmouth have picked up and reports of plastics and night crawlers around their typical stomping grounds (boulders and obstruct structures near shore and coves) have shown good success. The walleye and crappie have moved deep to avoid the warm water temps so you will need to bring your deep rigs. As of 8/1/2018 the Lake is at 738 surface acres with a surface elevation of 6185.30. Surface water temps around 72 degrees. Shore fishermen are catching trout on homemade dough bait, PowerBait (green color) and worms all along south shore. Reilly Canyon River has slowed down to a trickle and sandbars starting to emerge around the lake. The most action for fish is occurring in the early mornings and late evenings. Some catfish are being reported around the inlet Boaters have done well targeting walleye. Smallmouth caught early in the morning and late evening. Trout are caught during all hours. Worm harnesses and crank baits have worked well. Fish are being found around 15-25ft. The shallow water tends to be too warm for fish during the majority of the day, the technique has been to find the deep channels where colder water exists or wait for cooler morning and evening temps. BOATING ALERT: Due to water being released, boaters be aware of underwater hazards. Not all hazards will be marked. This 762-acre impoundment is located off of E. Quincy Avenue, two miles east of E-470. As of 8/1/2018 Water temp is 69 degrees. Trout fishing from shore is slow. Occasionally we have received a good report using PowerBait off the dam. Boaters reporting fair to good conditions on trout trolling with crawlers and lures. Some nice trout in the 18 -21 inches range have been caught recently. Walleye action from boats is slow to fair with an occasional good report. Some reports of largemouth being caught on top water lures. Restricted to electric motors only. For more information call 303-326-8425. Park hours August 5:30am-9:00pm. This 881-acre impoundment is located in Cherry Creek State Park, in Aurora. There are two entrances to the park, the east entrance off S. Dayton St. and the west entrance off S. Parker Rd. As of 7/30/2018 water temperature is 74 degrees the trout have been tougher to catch but some success has been reported using nightcrawlers along the bottom. Walleye fishing is good but can be tough with the large amounts of shad present in the system. As of 8/10/2018 Water temp is 65 - 69 degrees. As far as the warm water species goes, Quincy has been doing great as of late. If you are a trout fisher maybe it's time to expand your interest because the bass and pan fish have been very active and feeding heavily especially on top water lures. For bass particularly, reports of hoppers and poppers have been very successful (these flies and lures are particularly good in the mornings and evenings). The reservoir has also been a destination for people to flock on the weekends so it has been crowded so try fishing on a weekday. Park Hours for August 5:30am-9:00pm. Restricted to artificial flies and lures only. Electric motors only and hand launched watercraft only-trailers and vehicles prohibited in the water. For more information call 303-326-8424. This 1,356 impoundment is located in Chatfield State Park, as of 8/10/2018 water temperature is 73 degrees. There are reports of shad being very active and schooling up in large numbers. You should have good luck with bass, especially smallmouth, hitting the shad so keep a look out for the schools (bid activity always a good indicator to start with). Deeper fish have been reported around the 25-30 foot range. We have a fairly HOT weekend ahead of us so don't be shy to mix up the species even by doing a little carp fishing. They can tolerate the heat better than a lot of fish in our Front Range bodies of water and Chatfield has plenty monsters in there to go around. As of 7/23/2018 Trout fishing has slowed down with the warm weather but fishing for sun fish and bluegill is good. Please ensure the responsible and ethical release of fish. Trash cans are available to dispose of fishing line. As of 7/28/2018 the lake is starting to experience some algae blooms which can make the fishing tougher with decreased water clarity. Some pike have been caught on various baits along the edges of the weed beds. Trout fishing has been good using lures like in-line spinners or spoons for the larger fish. This 8,900 acre reservoir is located west of Gunnison. As of 8/1/2018, water levels are much lower compared to last year and concentrating the fish. Kokanee Salmon fishing has been fair while jigging. Colors that have been producing fish are pink, orange, and chartreuse. Smaller lake trout are being caught at the deeper depths of the water column. Perch fishing has also been good along the rocky sections of shoreline. Anglers can check on current conditions and boat ramp inspection schedules by contacting Curecanti National Recreation Area at (970-641-2337). As of 7/30/2018 the water level is a bit lower than in years past. Water temperatures are in the mid 60's fishing has increased some for trout with recent stockings, baits fished off the bottom in 20 feet of water. Lake trout have been tough but the deeper portions of the reservoir is where those fish can be caught using nightcrawlers off the bottom. Pike have been caught anywhere in the reservoir that has good weed growth. Many of the pike caught have been small in size. As of 8/1/2018 Fishing at Navajo Lake has been good. Small mouth bass fishing has been good in the main channel where the water temperature is a bit cooler. Many large Pike have been reported being caught using bait fish lures. Catfish fishing has been good by Windsurf beach area. The boat ramp at Two Rivers Marina is in good shape, and launching is good. The Marina store at the Arboles boat ramp has been moved to the Visitor center due to low water conditions. Ice, ice cream, drinks and snacks are available at the visitor store, gasoline is not. The boat ramp and ANS inspection station remain open. 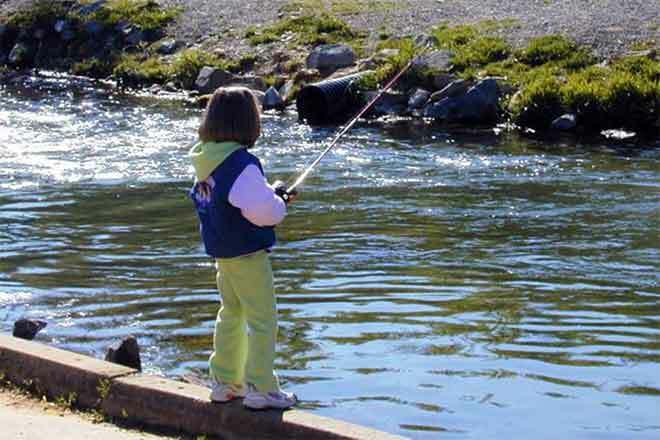 Colorado and New Mexico fishing licenses for the 2018-2019 season are now on sale and are available at the Visitor Center. Social security numbers are required for license purchase. ID is required for purchase of all Colorado licenses. Please remember to bring sunscreen, insect repellent and clothes appropriate for changes in the weather. As of 8/10/2018 Fishing for trout is good, lures of choice are worms, salmon eggs, spinners, and Rapala's. Fishing Ponds at Pa-Co-Chu-Puk have been fishing slow to decent with small worms, and egg imitations. Pa-Co-Chu-Puk River: has been fishing well with small nymphs, pale morning duns/nymphs, with occasional Green Drake hatches. Pink Cahill's have been producing excellent. Terrestrial season is here with hoppers, ants, and similar producing fish.